The fascinating world of the Huichol Indians is full of mystery, magic and tenacity. Their story is one of triumph over adversity, for the Huichol are a people that remain faithful to their religion, despite hundreds of years of oppression and society's attempts to assimilate them. The Huichol represent one of the few remaining indigenous cultures left in Mexico. They live in self-imposed isolation, having chosen long ago to make their home high in the mountains of the Sierra Madre Occidental, in Western Central Mexico. The states they reside in, Nayarit and Jalisco, are popular destinations for travelers seeking beautiful beaches and tropical breezes. Surfing is very popular in this region as is bird-watching and all manners of water sports. 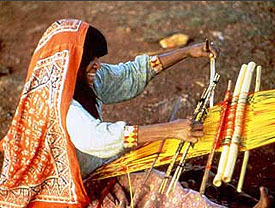 However, the Huichol live in the mountainous remote portions of Nayarit and Jalisco, far away from these activities. Despite many attempts by outsiders to convert them, the Huichol have remained true to their shamanic tradition, practicing the same rituals that their ancestors did. 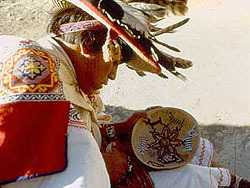 A highly spiritual people, their religious activities are focused on the ingestion of peyote, a hallucinogenic cactus. Sacred ceremonies are held while under the influence of this hallucinogen, under prescribed conditions and rules of conduct. The peyote ceremony for the Huichol begins with their journey to find it. The land where this sacred plant grows is located hundreds of miles from where they live in the remote desert of San Luis Potosi. The Huichol call this area "Wirikuta" and it is to this location that they make their annual pilgrimage to collect the sacred peyote. Once, this long journey was made by foot but today vehicles are used to travel to the general vicinity of where the plant grows. Peyote is not an easy plant to find. It grows under bushes and its color, a gray-green hue, blends impeccably with the surrounding terrain. 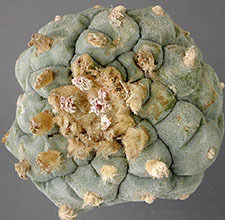 Sometimes peyote is ingested in order to find the plant and traditionally a shaman leads the group of people looking for it. The quest to locate peyote is considered a hunt and the Huichol seek spiritual guidance from the blue deer, an animal that is a major deity in their cosmology. Bows and arrows are oftentimes carried by the Huichol while on their search for peyote, to symbolize the intent of the hunt. In addition to the blue deer, which is depicted frequently in their artwork, the other major deities found in the religion of the Huichol are maize, the eagle and the sacred plant, peyote. The Huichol live in small groups called "ranchos", tilling the land and coaxing the growth of maize in a rugged environment. They are an impoverished people and although they have remained true to their heritage, the modern-day world threatens their existence. A viable way that they have found to help sustain them and their way of live is through their art. The artwork of the Huichol is incredibly detailed, rich with vibrant color and symbolism. The spiritual beliefs of the Huichol are interwoven in their colorful yarn paintings, intricate beadwork and embroidered textiles. For the Huichol, these handicrafts are a major source of income. By purchasing their artwork, you are helping to preserve an ancient people's way of life.